5 Secret Tips For That Organized Wardrobe You Dream About! As a woman, mom or fashion lover, an organized wardrobe is often at the very top of our wish list. When you have an organized wardrobe, it just makes finding everything so much easier. That favorite t-shirt, that special scarf you love or those awesome jeans, all have their own place where you can easily find them. It’s a new year, and I just love the feeling of being able to declutter and get rid of the old and bring in the new. Really, it’s just such an exciting and refreshing feeling to have at the start of a new year! Be sure to take advantage of still feeling extra motivated to organize, tidy and clean now at the beginning of the new year. 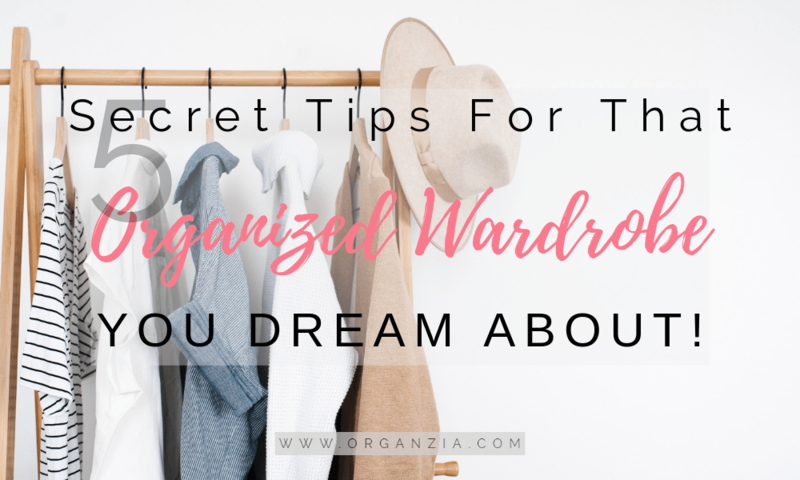 Now is really the perfect time to start of fresh, and finally get that organized wardrobe you dream about! How to easily get an organized wardrobe! Do I wear this?, is this something I actually need?, and do I really love this? Are you answering yes to all the questions? Well, great! Then you can confidently place the item in your keep pile. Is the answer to all the questions above is no, maybe it’s a sign that you should no longer keep that item in your wardrobe. If there are items that you’re unsure about, a trick could be to hang the item back on to the hanger, hang the hanger reversed from how you usually hang it. After 3-6 months have past, and the hanger hasn’t been touched this shows that you obviously don’t use it. Maybe it’s now time to let that item go? When you’re done with decluttering your wardrobe, it’s time to plan out the perfect wardrobe layout. Take into consideration how much space you have, and plan a wardrobe layout that works best for you. What items do you wear often, and need to find quickly every day? Make sure you place those items close to each other, to save precious time in the mornings. Other questions you can ask yourself. What do you need to hang up? What items don’t you use that often? Maybe I need to buy extra small bins or boxes, to easier organize my wardrobe? Write it all down! You can also make a simple sketch of your wardrobe, so you can easily visualize how its best to organize it. Make sure that there’s always some extra space left in your wardrobe. Your wardrobe will be so much easier to keep organized if it’s not completely full. Also, make sure to properly clean your wardrobe before putting all your stuff back in your wardrobe. You now know what items you want to keep, and you have planned how you want your organized wardrobe to be. Another thing to decide is how you should store all your things. It’s a good idea to think about how you can store your clothing in the smartest, and most space-saving way. For instance, to hang your clothes on hangers will take up much more space than folding them in a drawer. To help you keep your folded clothes neatly organized in your drawers, use some organizer bins that fit nicely within your drawers measurements. For all the clothing that you need to hang up on hangers, a good idea is to use space-saving hangers. These hangers will save you so much space in your wardrobe, and actually making it possible to hang up more of your favorite clothes for a beautiful and organized feel in your wardrobe. If you really want an organized wardrobe, it’s a good idea to organize all the things in your wardrobe by type and how often the item is used. A simple way to do this is by sorting similar items in groups. Sort all the belts, sweaters, long-sleeve shirts, work pants, button-down shirts, dresses, jeans, shorts, swimwear, accessories etc in groups. After doing this you’ll see how much space you need for each group. So now you can decide how it’s best to store the items. Think about how you can easily save time while getting dressed in the morning. Place the clothing you use on a day to day basis in the best spots in your closet. Making sure to keep them close by each other. By doing this you can easily find what you’re looking for when you’re in a hurry. And even more important, doing this will definitely save you so much time. The very top of your closet is a perfect place for tucking away all of the out-of-season items. And all the clothes you only wear on special occasions. Don’t store your accessories together with your clothes, try to find a separate space to organize and store your accessory items. You can easily organize your jewelry, belts, scarves, and sunglasses beautifully in a drawer using a display tray or an organizing tray. If you have limited space, or don’t want to store your accessories in a drawer a great option is to use a space-saving hanging organizer. Hang it up inside your closet wall, or an empty door for easy access to all your favorite accessories. Finally, if you want to keep your newly organized wardrobe organized, you need to make an effort into maintaining it. Put in some extra effort once a month and spend a quick 30 minutes looking over your wardrobe. Is everything still where it should be? If not, put it back where it belongs. Are there items that are torn or worn out? Do something need to be fixed? You can remove all the clothing you don’t want to keep, and you should repair the clothing that needs to be repaired. Also, mark in your calendar and commit to a full re-organization and cleaning session at least once a year, to continue keeping your wardrobe organized. If you loved these organizing tips, you might want to check out how you can easily organize your bathroom drawers here. For great kitchen organizing ideas, read all about how you can organize your kitchen drawer and how to easily organize your spice drawer here. 6 Simple Steps To That Organized Kitchen You Always Wanted! Top 10 Organizing Gifts For Women Who LOVES Organizing!